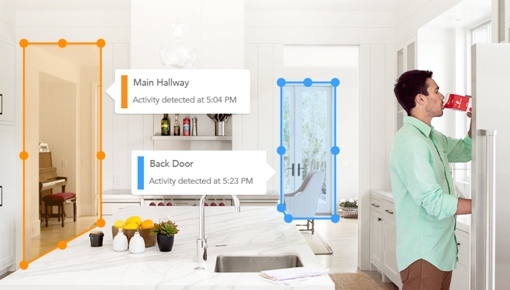 The folks behind the popular remote home surveillance camera Dropcam announced a cool new security feature today called Custom Activity Zones, allowing you to select specific areas of your camera’s view for motion detection alerts. When motion is detected in one of the zones you create – say, the part of your camera’s view that only includes your back porch – you’ll receive an alert on your mobile device. You can then log in to your Dropcam account to see exactly what caused the alert. Even if you create an activity zone today, you can review activity in that particular zone for all your past saved footage. That way, if something in your home goes missing, you can easily isolate that part of the camera’s view and quickly find footage of the culprit. To take advantage of Dropcam’s new custom activity zones, you’ll need to subscribe to one of Dropcam’s cloud recording plans. Those start at $9.95 per month ($99/year) for 7 days of continuous saved video, and run up to $29.95 per month ($299/year) for 30 days of video. The Dropcam Pro camera, which has a 130-degree field of view, 8x digital zoom and two-way communication is available on Amazon.com for $199.99. To learn more about the device and its new custom activity zones, visit the Dropcam blog and check out the short video below. For other cool remote home surveillance tools, check out our guide to stopping home disasters before they occur.